AlternateHistoryHub, hosted by Cody Franklin, analyzes histories best hypothetical scenarios, with humor like burnt toast. History is replete with turning points; major intersections in which critical decisions, the benefit of wisdom, the outcome of folly, and damned luck have molded the world we know as the present. Being part and parcel to the human condition, many cannot help ask “What if?”when discussing major events in history and the possible consequences. “What if the Axis won the Second World War?” “Had Julius Caesar not crossed the Rubicon, what would have become of Rome?” “What if Mao Zedong had been assassinated in 1930?” AlternateHistoryHub is dedicated to analyzing these historical hypothetical scenarios in an incredibly innovative fashion; by way of humor that is as dry as burnt toast. AlternateHistoryHub, with it’s host Cody Franklin, continue to be one of the Internet’s best kept secrets. To understand the AlternateHistoryHub today, one must understand its own history and evolution. The AlternateHistoryHub was created in late 2012 by Cody Franklin, the channel’s narrator, animator, and overall brain trust. Mr. Franklin, or as he is known by his audience “Cody of the AlternateHistoryHub,” is a college student from Ohio responsible for this singular undertaking. AlternateHistoryHub originally debuted with episodes that were little more than flowing PowerPoint’s, employing an ominous musical score. AlternateHistoryHub today is now realizing a look and feel that is a fully unique brand. 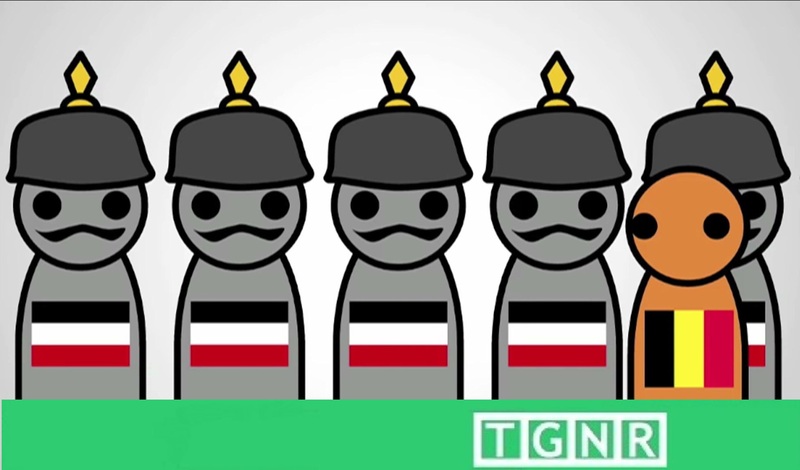 The channel uses animation that depicts various individuals or peoples from history as identifiable caricatures. Each are portrayed with a fundamental appearance of perfectly circular heads, theatrically placed black dotted eyes, atop modified-oblong bodies. AlternateHistoryHub caricatures each include symbolic attributes of various peoples; all used to flesh out the on-screen narratives for potential outcomes due to a changed event in history. Screen Shots AlternateHistoryHub "What if the Islamic Revolution Never Happened?" America swinging its “Freedom Stick. Cody Franklin’s narration has proven a cornerstone in the channel’s success. As time has progressed, he has not only honed the perfect voice for his brand of humor and story telling, but has in every way that matters made each episode his own. The script writing for each scenario is not simply dry humor with impeccable timing, but includes an impressive understanding and appreciation for even the smallest details in history that are so often overlooked. Occasionally episodes with significant length require condensing. AlternateHistoryHub is very careful to note when it’s condensing important historical explanations for time purposes. Moreover it is qualified that every scenario published is only one alternate possibility among infinite others possible to the thought experiment at hand. In the channel’s tenure, AlternateHistoryHub has never shown overt reservation regarding any possible historical permutations. Whether modern or in antiquity, there is demonstration of clear respect when evaluating devastating portions of history, yet with the courage never to shy away from the facts they represent. Audience generated content has served as a powerful cornerstone to the site’s character. Episodes depicting alternate countries and their fictional histories, created by fans, have shown to be immensely popular. Alternate countries and histories include how they emerged, and their uniquely designed flags. It is clear that in stimulating thought as to what might have been, one can generate a greater insight into why history occurred as it did. Screen Shot AlternateHistoryHub "38 Alternate Countries in 15 Minutes"
Case and point: Alliance of Siberia. Following its recent seven-year anniversary in December 2018, the AlternateHistoryHub currently has over 1.6 million subscribers on YouTube. In an attempt to further improve the AlternateHistoryHub product, the channel utilizes the crowd funding source Patreon where users can donate to the channel on a monthly basis, at their desired amount. According to AlternateHistoryHub for a certain level of contribution patrons recieve, “access to loosely edited videos that dive deeper into my most recent scenario after ever new video.” As well as themed desktop wallpapers depicted in the channels visual motif. It is clear that when it comes to “what if?” questions, Cody Franklin clearly asked himself the most important one: What if I do something different? 1.6 million subscribers are thankful he did. Those same fans eschew an alternate history where he did not. Enjoy the video below to understand just why that is.